Where to even begin with this? 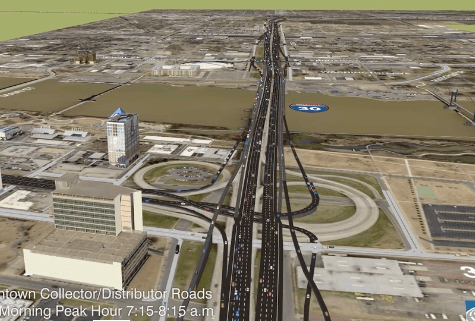 Officials in Arkansas are pushing a plan to widen a partly elevated highway through the center of Little Rock from six lanes to 10 lanes at a cost of $600 million. It’s bad enough that the state wants to ram an elevated highway through downtown at a time when many cities are looking to tear them down, but it gets worse. To widen I-30, the state would require Little Rock to rip up part of an existing streetcar line. What the heck is going on here? Arkansas Department of Highways and Transportation just completed a year-long environmental study for the project they call 30 Crossing. The agency’s “preferred alternative” is the 10-lane highway widening, which it believes is the best way to “relieve congestion, improve roadway safety” and address structural deficiencies in the road. Tim McKuin, a local resident who writes the blog Move Arkansas, says the impetus for the project was the I-30 Arkansas River Bridge, which needed to be replaced. In addition, state highway builders are flush with cash after Arkansas passed a half-cent sales tax measure for increased highway spending in 2012. Multiple options were studied, and the state ended up favoring the version with the most highway widening. The road can’t be widened to 10 lanes without removing a portion of Little Rock’s streetcar, meaning the line would no longer serve two of its most popular destinations: the Clinton Presidential Library and the headquarters of the global charity Heifer International. Tearing up the streetcar would also foreclose the long-discussed possibility of extending the streetcar to the airport, said McKuin. Resistance to Arkansas DOT’s vision for downtown Little Rock is building. Max Brantley at the Arkansas Times called it a “keep busy” project for state highway builders, writing that he drove the length of the highway at rush hour last week at the speed limit. A coalition of local architects and engineers called Studio Main wrote a letter [PDF] detailing 11 major concerns about the project, including the prioritization of drivers over pedestrians and cyclists. Some residents, including attorney Brad Walker, have even proposed replacing the elevated highway with an at-grade boulevard. The project poses particular concerns for the popular River Market entertainment area. Even the project planners have noted that widening the road to 10 lanes is likely to just move bottlenecks to other parts of the interstate system. Widening other highway segments in response to that traffic would cost an outrageous $4 billion. This latest abortion foisted on downtown Little Rock by the Arkansas HIGHWAY and transportation Dept. is appalling across so many levels, I’m not even going to address it. What I WILL offer is that Arkansas (Gov’t bureaucracies excluded) DOES have progressive, forward thinking, innovative, TOD options that have been promulgated and discussed for a decade by the Metropolitan Area Transit Consortium. We invite any of you to look in on what we’re up to, and certainly to help us block/delay/deny/defer/destroy/and otherwise make “not happen” this proposed abomination of asphalt upon the Natural State. Thank you. I wish Little Rock good luck in killing this monstrosity. With $4 billion, one could build a MASSIVE bus rapid transit system that would provide congestion relief and alternatives for the entire metro area. Where are all of the fiscal conservatives outraged by heavy-handed big government and out-of-control public spending? THIS is where, more than anywhere else, it can be found. Whatever subsidies go towards public transit are rounding errors by comparison. Most people who claim to be “fiscal conservatives” support massive budget deficits, reckless tax cuts, and reckless increases in military spending. Most people who claim to oppose “out-of-control public spending” actually support out-of-control public spending on the military, and oppose even *auditing* that spending. Most people who claim to oppose heavy-handed big government supported (a) the largest increase in government employment in decades, in the form of the Homeland Security Department, (b) the government spying on all Americans in violation of the 4th Amendment, (c) police assaulting and beating innocent people. I’ve concluded that these right-wingers who claim that they oppose these things are mostly just phonies. Genuine people opposed to “heavy handed big government” are ACLU members. Genuine “fiscal conservatives” and people who oppose “out of control public spending” are the people who are called “leftist” who are at blogs like this. Was indeed a rhetorical question. I think your analysis is 100% spot on. There was a posting on Facebook in memory of US military personnel killed in Vietnam. Their loss should be remembered and mourned, but my comment was, “Why were they there in the first place?” Another FB post showed the US Navy’s newest aircraft carrier, truly a marvel of modern technology–but it doesn’t help US soldiers attacked by raggedy “militants” with home-made bombs. Standard practice for the highway planners at state DOTs is to sacrifice all other concerns at the altar of fast car traffic. Nowhere has the effect been more obviously detrimental than Detroit, where the overbuilt freeway system helped hollow out one of America's largest cities. But highway planners in Michigan are starting to listen to people who say they want something different.